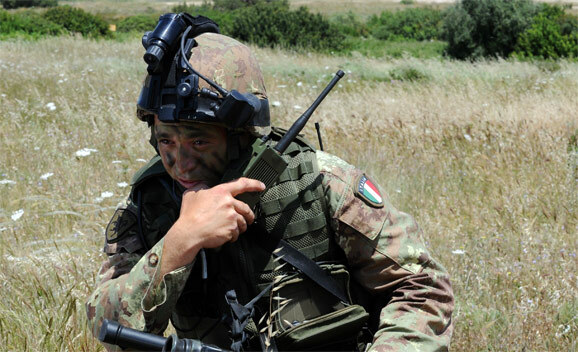 Future Soldier is a programme for the Italian Army developed by Selex ES, a Finmeccanica company. The programme is designed to digitize the battlefield and to improve effectiveness and capabilities of soldiers as per the NATO five point plan. Q: We discussed Future Soldier with you last year. Where are you now as regards lightening the load to the individual troops? A: Well, the reduction in the weight of equipment for the individual soldier was made a priority at the beginning of the development programme. Progress is underway in this area of the programme. Our equipment has been engineered out of materials specially chosen to be as light as possible without compromising on durability. Q: What are the benefits of the new products you are deploying, over what is currently being used; could you go into detail in areas such as troop survivability, troop lethality and so on? A: There are many benefits to using these new products. First of all, our night vision and optronics product NIMOS can improve mobility and situational awareness via effective light intensification technology. There is also our Linx target acquisition system which allows all weather observation, detection and recognition to improve situational awareness. Both of these products are networked with the soldier’s wearable computer. In the area of lethality, new Beretta’s rifles are being introduced as part of the Future Soldier programme and we offer the grenade launcher fire control system Scorpio. Scorpio provides quick and accurate pointing and firing at both static and moving targets, increasing the probability of hitting the target. Q: Interoperability with troops from other countries is also a key area across Future Soldier programs. How have you been progressing in this area? A: For the area of interoperability, that is, for allied troops fighting alongside each other, we make sure that the C4I systems can talk to each other and that the radio and data communications protocols in use are compatible and share maximum level of security as well. Q: What have been the key areas of improvement that Future Soldier has provided so far? A: Since the start of the programme we have seen an improvement in these areas which you have mentioned such as sustainability, command and control. We can be expected to see further improvements in the coming months as new products are released and deployed. At the moment we are carrying out further testing and development of products which are intended to be integrated into the programme the end of this year. Hopefully we can discuss these in our follow up interview and talk about the benefits that they have delivered.